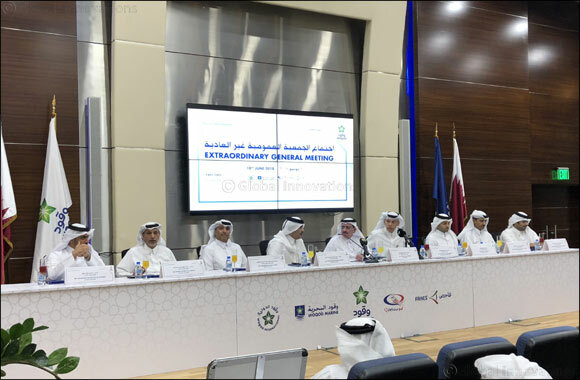 Doha, Qatar, June 11, 2018: Qatar Fuel (WOQOD) Extraordinary General Assembly (EGM) Chaired by Mr. Ahmed Saif Al-Sulaiti, Chairman of the Board of Directors held its meeting on Sunday 10/06/2018, where the EGM amended Article 9-1 of the company Articles of Associations to raise the non-Qatari ownership to 49% of the company share capital and to raise the limits of ownership to the one shareholder to 1%. Engineer Al Muhannadi pointed out to and drew specific emphasis on the dual professional legal status of WOQOD, maintaining that WOQOD is at the same time a profit making listed public shareholding company pursuing profits and welfare for to its shareholders, and is subjected pursuant to this legal status to stringent Laws , Regulations and Regulatory Bodies just like any other shareholding company , and also it is considered a public services company duly established by the Government represented by QP to perform on exclusively basis the downstream Oil and Gas services to the State and Society in the State of Qatar, including airports and seaport irrespective of profits to be derived from the activity in all cases. WOQOD by venture of this service status is also subjects to other different more stringent sets of Laws, Systems, Regulations and Decisions particularly in fields of Health, Safety, Security and Environment. Engineer Al Muhannadi further stressed that in case of conflict between WOQOD aforementioned two status, the service status will reign supreme based on Public Policy considerations. Mr. Al Muhannadi gave more elaboration on the Services Function Status of WOQOD by giving some examples including, without limitation, the building of many retail petrol stations in remote locations within the territory of the State of Qatar although the economics of such stations is very weak and fragile, explaining that the company is building such low revenue deriving stations in the discharge of its legal responsibility and its obligation towards the State and the Society in the exercise of its Public Services ‘ Function. Mr. Al Muhannadi is this same respect pointed out that WOQOD is currently investing an amount of QR. 634 millions in this year for adding new stations and additional dispensers in some new stations to achieve the highest level of optimization as well as to prevent or at least to decrease the cars’ queue in the stations occasioned by the close out of many private petrol stations. In the field of Gas Stations Mr. Al Muhannadi speaks firstly in respect of the current number of the gas stations owned by the company to date, stating that it began with only two in the year 2003 to reach currently 64 gas stations and it is highly expected that the number will rise to 88 gas stations by the end of the year 2018, where 30 additional Gas Stations, ten of which are movables, will be built in this year. Mr. Al Muhannadi maintained that WOQOD current share in the fuel retail market reached 64% compared to only 48% in the year 2016, and stressed that the percentage share will rise to 85% by the year 2020. In respect of new Gas Stations building, WOQOD CEO highlighted that the year 2018 has thereto witnessed the building of four (4) immovable Gas Station in Al Egla , New Slata , Al Thummama and Motor City areas, in addition to two movable Gas Stations. Mr. Al Muhannadi elaborated that in addition to 8 movable gas stations, 16 more immovable Gas Stations will be built in the current year 2018 in Lusail City, Fox Hill, Fereej Kulaip , Old Slata , Rawdat Al Hamama 2 , Al Khairitiyat , Al Gharaffa ( Ezghawa), Al Thummama 2 , Wholesale Market , Umm Ebairiya , Messaimeer South , Al Wakra 2 , Hazm Al Markhiya, Al Froosh, Al Ezzaiziya , HIA , Wadi Aba Saleel. Mr. Al Muhannadi explained that the option to operate movable Gas Stations has been resorted in order to address the absolute necessity and essential need to cover the supply deficit prompted by the private petrol stations close out. Mr. Al Muhannadi depicted WOQOD Gas Station as being modern, integrated and providing State- of- the- art Services on international standards. He went on to say that such gas stations are deemed and actual addition to the current development and modernization progress abounding in our beloved country. In respect of future policy for gas stations building Mr. Al Muhannadi further explained that WOQOD is currently deploying all of its efforts and resources to implement its ambitious plan to double the number of its gas stations within three (3) years period to reach 120 gas stations by the year 2020. He directed his thanks and gratitude to the Government of the State of Qatar for the allocation of the sufficient number of plots in furtherance of WOQOD Gas Stations Construction Policy, assuring that WOQOD, in furtherance of its afore said Service Status, will not hesitate to build any gas station in every location where the plot of land is to be allocated whoever remote and irrespective of the economics of the same. Mr. Al Muhannadi concluded his speech in this regard by saying that WOQOD is looking forward for more land allocation in Doha City for Gas Stations building in order to decrease the pressure on the current stations. Engineer Al-Muhannadi spoke about company phased plan for doubling the efficiency of the new petrol stations, currently under construction, by adding new dispenses to better serve the public and avert queues resulting from the decommissioning of many privately owned petrol stations, embedding the smooth flow of traffic and causing waste of time. WOQOD is undertaking such dispenser additions in line with its role as a public service provider. Engineer Al-Muhannadi pointed out that, the additional dispensers to be installed in the year 2018 will amount to 51% (equivalent to 158 dispensers) of the current total number of dispensers. Additional dispensers installation will continue with the same pace during the years 2019 and 2020. He further highlighted the other measures taken by WOQOD to improve customer satisfaction and give effect to its social responsibility, where WOQODe electronic fueling System is installed in cars thus availing customers with new economic privileges. Engineer Al-Muhannadi gave a comparison between petrol station growth rate and fuel sales growth rate, where the company is determined to double petrol stations by effecting a 100% increase during the 3 coming years 2018 – 2020 with the view to achieve customer satisfaction and avert queues in the petrol stations, despite the fact that, the increase of fuel consumption during the said years will not exceed 10%. 10% Increase in average yearly jet fuel sales. WOQOD is currently engaged in discussions with HIA and Civil Aviation Authority to improve the storage capacity at HIA, to meet the growing demand and to take full advantage of the new pipeline connection from Ras Laffan, where WOQOD will on its own expense, construct additional jet fuel tanks at HIA. WOQOD ensured uninterrupted supply of Bitumen in the local market. Sales increased by 275% from 2016. WOQOD local market share increased from 60% to 90%. Bitumen logistics and supply chain were strengthened to meet the increasing demand, where WOQOD is currently engaged in the phased construction of bitumen storage facilities at Mesaied Port. Engineer Al-Muhannadi pointed out that, WOQOD is currently performing bunker operations from all Qatari Ports and within Qatari territorial waters based from bunkering facilities at Ras Laffan, owned by Qatar Petroleum. Bunker Operations from the facilities, started in 2017 in collaboration with Qatar Petroleum, where bunker distribution increased to 10 times in comparison with quantities distributed in 2016. WOQOD Chief Executive Officer explained that, the product consumption quantities has been on the rise since the year 2015. LPG sales increased in 2017 by 17% from the sales achieved in 2016. Cylinder sales increased by 7%, where WOQOD is launching promotional offers for SHAFAF Cylinders to persuade customers to phase out high risk steel cylinders and finally replace them with safe high quality SHAFAF cylinders by 30/06/2018. WOQOD is supplying natural gas to the factories located in the new industrial area. WOQOD is also operating a station for compressed natural gas (CNG). Collaboration is on going with QP for managing and operating new CNG Stations across the state of Qatar as WOQOD is managing and distributing the product from a pilot station since the year 2012. WOQOD is performing vehicle technical inspection services through its affiliate company (FAHES) using the most advanced modern inspection techniques. It is worth mention that the affiliate company; WOQOD Vehicle Technical Inspection Company (FAHES) started operations in the year 2009 with a single station at industrial area, however WOQOD implemented vehicle technical inspection projects in pursuit of provision of the highest standard of services to the state and the community at large, and achieving customer satisfaction. The number of vehicle technical inspection centers has reached 12 centers,comprising 7 permanent centers and 5 mobile stations. Construction work for heavy vehicles inspection center at Al Mazrooaa is currently underway. The company is planning to build another center at Mowate City. As to the legal framework for inspection services, the exclusive contract for vehicle technical inspection service with the Ministry of Interior has been renewed for a further period of 5 years. The affiliate company, WOQOD Marine is primarily rendering support services to company operations in the field of bunker fuel and bitumen, where it performs all operations pertaining to the import and transport of bitumen to the State of Qatar, and distribution of bunker fuel within the Qatari ports and territorial waters. Due to the increase realised in the distribution and sale of these two products, the vessel utilization rate increased to 92% in the year 2017 compared to 78% achieved in the year 2016. These vessels effectively contributed- and are still contributing-to the breaking of the grip of the unjust blockade, by supplying and distributing a significant part of the country requirement of bitumen product. The company is planning to supplement its fleet by more bitumen and bunker fuel carrying vessels in accordance with the requirements of the local Qatari market. Non-fuel sales realised a 17% increase in the year 2017 in comparison with the year 2016. The company introduced new lubricant brands compliant with car manufacturers recommendations, including Castrol, Shell and Total. Dry cleaning services were also introduced in some fuel stations. Engineer Al-Muhannadi pointed out that, WOQOD has a multi-initiative policy for cost optimization and profitability fostering, through achieving efficiency and effectiveness in company operations and activities. Some of these initiative were implemented during the year 2017, and the rest will be completed in this year 2018, particularly in the areas of inventory and engineering services. WOQOD has completed a comprehensive reorganization in order to make the company more efficient and effective. WOQOD has a number of initiatives and basic future plans in pursuit of providing the highest standard of services to the state and the community at large, and enhancing WOQOD core activities to meet shareholders expectations and achieve customers satisfaction. Finally, Engineer Al-Muhannadi expressed his thanks and appreciation to all government entities, public and private institutions, honored shareholders, board of directors and all WOQOD employees for their sincere efforts for serving and developing the company, and he vowed to exert more effort and deliver the utmost during the forthcoming period in furtherance of company future objectives.